The Food Writing Awards honor the best examples of food writing across nine categories, whether published in print or online. This awards program is open to both IACP members and non-members. The Food Writing Awards were first presented in 1991 to honor excellence in food journalism. The awards were formerly named after Bert Greene (1923-1988), a nationally renowned cooking teacher, cookbook author, and syndicated food columnist. Each year, the Food Writing Awards Committee selects the best example of food writing in any of the 9 categories. Entries are judged against a detailed list of criteria unique to each category. This awards program is open to both IACP members and non-members. Culinary writing that has been published online, in a newspaper, newsletter, or magazine Jan.1-Dec. 31 of the current calendar year. Submission deadline: February 15, 2019. Please read the category descriptions carefully. Candidates may submit works that appeared in any media (print or digital) that were originally posted or published between Jan. 1, 2018, and Dec. 31, 2018. If you are unsure of what category to submit, please contact shani@iacp.com. This award seeks to recognize author(s) who write on beverages (wine, beer, cocktails, other), in a designated “column” or structured repetitive format. Entries will be judged on mastery of language, clarity of thought, explanatory writing and ability to engage and maintain a consistent tone and relationship with the reader. Entrants must submit a minimum of three articles; may have more than one contributing author. A culinary-related story, with or without recipes, which documents a sentimental experience, based on a physical, intellectual, or emotional journey. Entries are judged on mastery of language, depth of thought and research, clarity and coherence of ideas, resonance with the reader, originality, and focus. 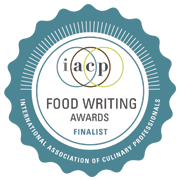 This award seeks to recognize author(s) who write on food, in a designated “column” or structured repetitive format. Entries will be judged on mastery of language, clarity of thought, explanatory writing and ability to engage and maintain a consistent tone and relationship with the reader. Entrants must submit a minimum of three articles; may have more than one contributing author. This award recognizes the communication of technical expertise around food or beverage preparation, specifically through the development of professional-quality recipes. The entries are judged on the clarity and precision of the recipes, how well they communicate the craft through instruction on various components such as ingredients, techniques, timing, and measurement, as well as food science and safety. The entries are judged on mastery of language, depth of thought and research, clarity and coherence of ideas, resonance with the reader, originality, and focus. When recipes are included, they should add an extra dimension, helping the reader to conceptualize distinctive aspects of the topic under discussion, such as unique ingredients and/or techniques. The entries are judged on mastery of language, depth of thought and research, clarity and coherence of ideas, resonance with the reader, originality, and focus. When recipes are included, they should add an extra dimension, helping the reader to conceptualize distinctive aspects of the topic under discussion, such as unique ingredients and/or cooking techniques. An article of a personal nature that shows a development of thought or perspective that the author ties with a culinary subject or issue. Entries will be judged on a demonstrated mastery of language, clarity of thought, persuasive explanatory writing, ability to engage the reader on an emotional level and original focus on the subject at hand.